Despite the sharp declines in the stock markets in April, the forecast for the art market is only cloudy. With the art market close to its all-time peaks, the uncertainty in the financial markets is sure to throttle back escalating valuations, but the auction houses have generally become much more discriminating in their offerings and more conservative in their estimates so that they are less at risk than they were in the early 90s when the art market collapsed. These concerns, however, have not left the auction houses standing still and both have spruced themselves up with major new quarters, redesigned catalogues and websites. This is the first "flagship" auction that Christies will "web-cast" live. It initiated such web-casts for a couple of "celebrity" auctions - "A Selection of Eric Claptons Guitars" last June and "The Personal Property of Marilyn Monroe" last October. In addition to this auction, Christies will conduct live web-casts of its evening auctions of 20th Century Art May 9 and Contemporary Art May 16. The auction house also posted this month on its website (www.christies.com) a video tour of highlights from this auction and the 20th Century Art auction hosted by Michael Findlay, its international director of fine art. In addition, this week it posted an "exclusive visit and interview with celebrated contemporary artist Jeff Koons, who will discuss his career, his five signature works that will be offered in Christies Contemporary Art evening sale, and his highly anticipated new exhibition, Celebration." Sothebys, meanwhile, has been actively promoting its on-line fine-art auctions while its management is adjusting to the resignations of its chairman and president in the wake of the anti-trust investigation. This auction is highlighted by two excellent water lily paintings by Claude Monet (1840-1926), a very strong Parisian window scene by Gustave Caillebotte (1848-1893), shown at the top of this article, a very good Henri de Toulouse-Lautrec (1864-1901), a nice landscape by Paul Gauguin (1848-1903), and some pleasant works by Edgar Degas (1834-1917), Pierre-Auguste Renoir (1841-1919) and Vincent Van Gogh (1853-1890) and several good sculptures by Rodin (1840-1917). The first Monet water lily picture in the auction, Lot 21, "Nymphéas," is a 35-by-39 ¼-inch oil on canvas that was painted in 1906. 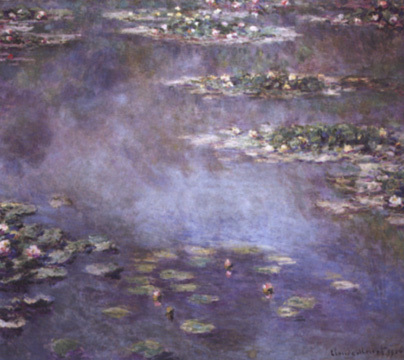 In the early 1890s, the artist purchased property in Giverny, France, and created a water lily pond that would become the main focus of his art for many years. This work, shown above, is a very fine example of this famous series and has been in the same private collection for 85 years. It has an estimate of $20,000,000 to $25,000,000. It sold to an anonymous buyer for $20,906,000 (including the buyer's premium as do all sales results in this article). The second Monet water lily painting, shown below, is Lot 33, "Le bassin aux nymphéas," a 40-by-79-inch oil on canvas that was painted between 1917 and 1919. It, too, is a very fine example of the series and its strong yellows and large horizontal format make it very striking and more interesting than the other, squarish and bluish painting. It is estimated very conservatively at only $9,000,000 to $12,000,000 perhaps because it is a later and larger work and has changed hands fairly often and once was owned by the Art Institute of Chicago. It sold for only $6,826,000 to the "trade." It is a much more exciting painting. In Le Bassin aux Nymphéas, Monets innate ability to organize his sensations of the transience of natural phenomena is readily apparent. The ambiguous spatial relationships of colors and forms are critical to this passionate description of his aquatic garden and there is a charismatic tension generated between the solid forms of the floating flora and the intangible elements of the forms of colored reflections dancing on the surface of the water. Inspite [of] the predominance of green, the canvas is exceptionally bright, its brilliant touches of blue and yellow enlivening the reflection of the sky and overhanging tress in the dark and brooding waters. The composition is further balanced with small touches of intense red. There is neither beginning nor end in this reflective surface, only the myriad of colors used to describe the flora, the changing light, and the motionless water. Precise as his recordings of phenomena are, it is an image rich with allusions to an ethereal, mystical realm." The catalogue also reproduces in color two other Monets of the same title, subject and period, one of which is in the Musée de Beaux-Arts de Nantes and the other in the Walter H. Annenberg Collection, Metropolitan Museum of Art (on loan). The formers composition is more amorphous than this lot while the latter is more detailed and greener. Another Monet in the sale is Lot 42, "Falaise près de Fécamp," a very bright and strong seascape. The 24-by-31-inch oil on canvas was apinted in 1881 and has a very conservative estimate of $1,500,000 to $2,000,000. It sold for $1,656,000. The Caillebotte, Lot 8, is entitled "LHomme au balcon, boulevard Haussmann" and is a 45 7/8-by-35 1/8-inch oil on canvas that was painted in 1880. The painting, which is shown at the top of this article, has been widely exhibited and has extensive literature, and has an estimate of $6,000,000 to $8,000,000 that probably reflects its prestigious exhibition history and its very strong composition highlighted by its marvelous red-and-white-striped awning and decorative balcony. It sold $14,306,000, a world auction record for the artist, to an anonymous buyer. It is, without question, one of the great urban paintings. The viewer is propelled into the paintings center with a sense of security, curiosity, awe, wonder, comfort and reverie. It is a bright spring day and the trees are at their most refreshingly green and the grandeur of Haussmanns uniform townhouse architecture is exceeding grand as it continues into the distance. Unlike some of Pissarros or Monets urban vistas that usually extend fully down a boulevard, Caillebotte presents only an angled, partial view of the boulevard, but one that is sufficiently large to convey the monumental might of a great city. The man in the picture, seen only from the back, is elegant in his top hat, and self-assured in his pose leaning against the balcony. The drapes on the opened French door at the right give both upwards and downwards diagonals that reinforce the pictures verticality and also focus on the center of the painting. The bold striping and strong reds of the canopy are not only festive but protective and its scallop-like border counterbalances the decorative swirls the balconys ironwork. Besides being very painterly, the work, which is the cover illustration of the catalogue, is remarkable for it could be cropped into many smaller fine compositions. The strong figure of the man in his dark attire, of course, stands out markedly and could be construed as a defiant celebration of the independence of the individual in the communal confines that cities represent. The figure forces the viewer into a contemplative mood. We are not overlooking his shoulder but placed several feet away from him, not interrupting his space, or thoughts, or momentary privacy. Childe Hassams great "flag" pictures of Fifth Avenue in New York and George Lukss wonderful parade and street scenes are socially "involved" but somewhat impersonal works. This, in contrast, is intensely personal. At first glance, one is tempted to categorize this as a somewhat academic Impressionist painting, but its forceful composition rises it to a much higher plateau. It is very hard to resist stepping into the picture and starting up a conversation with this dapper man-about-town. Another figure in black attire who is arresting is shown above in "La femme au chapeau noir, Berthe la Sourde," Lot 18, a 24 ¼-by-17 ½-inch oil on board by Henri de Toulouse-Lautrec. Painted in 1890, this is a great Lautrec of fabulous brushwork and very memorable intensity. The painting has the fresh, sketchy quality of a pastel and quite an exotically muted palette for the background, but the womans face is remarkably fascinating. She is not beautiful, but she rivets the viewer with the intensity of her direct stare and her "frozen" lack of expressiveness. Is she infatuated? Is she longingly resigned to a sad fate? Is she comfortable with her erect pose clutching a big umbrella? Is she proud to being portrayed? Did she pick out her very large and unwieldy hat? The painting, which was formerly in the collections of A. Conger Goodyear and Sam Salz and is being sold by the state of Guy Bjorkman, has an estimate of $6,000,000 to $8,000,000. It passed at $3,400,000, one of the sale's major disappointments, perhaps because the women's expression was too stern for lovers of the picturesque. According to Christies, the womans nickname, "la source," means "the deaf" and the artist apparently knew her from the Green Parrot, "a brothel he frequented." "In the portrait, she is primly attired in a long-sleeved dress and elaborate hat, self-consciously posing as a lady of society. A wry mixture of candor and contrivance, it ultimately reveals a sensitivity and sympathy for the sitter that belies the artists reputation as a painter of caricature," according to the auction houses press release on the auction. Lautrec, of course, is no mere caricaturist, but one of the greatest artists in history and his works are quite rare and while this work does not have the exuberant flamboyance of his can-can saloon works, its humanity is searing, deep and loving. Berthe may be prim, but not pitiable. She may not be a saint, but she has suffered and her poignant, mysterious gaze makes us want to survive. Lot 30, shown above, is an important Brittany scene by Paul Gauguin. The 28-by-25 1/2-inch oil on canvas was painted in 1890 and has an estimate of $7,000,000 to $9,000,000. It sold for only $5,286,00 to a private collector, its low price perhaps reflecting the fact that newer collectors are more interested in his more exotic scenes. Extremely lush and vibrant, it is one of his last works in which he employed Impressionistic techniques. The painting was exhibited for 15 years at the Dallas Museum of Art on loan from the collection of Wendy and Emery Reves. The artist had moved to the village of Poulu with Jacob Meyer de Hann, a Dutch painter, after staying in Pont-Aven. The catalogue notes that Gauguin felt his mission was "one of physical fusion with theland as it also implicates his role as spiritual prophet, one seeking to unlock nature's hidden secrets." The catalogue provides the following quotation from Charles Chassé, a Gauguin scholar: "...in Poulu, Gauguin would continually praise the charms of the savage life. He strongly urged de Haan and his other friends to follow him in a definitive emigration to those lands innocent of all culture. First, because the savage life appeared more beautiful to him. Light more radiant, colors more lively, lines more sensual, the lack of ugly and distorting veils hiding the human body, a more rational development of muscles and bodies, and everywhere the more elegant and supple rhythms of movements and postures." The catalogue also quotes a letter written by Gauguin to Vincent Van Gogh: "Yes, you are right to want painting to have a coloring evocative of poetic ideas...I find everything poetic, and it is in the deepest recesses of my heart, that are sometimes the most mysterious, that I glimpse poetry. Forms and colors brought into harmony produce poetry by themselves." The auction has a pair of 1887 paintings by Vincent Van Gogh that come from the collection of Mr. and Mrs. Charles Gilman, and are being sold to benefit Tel Aviv University and the Tel Aviv Museum of Art. One of then, Lot 34, "L'Entrée de parc de Voyer-d'Argenson a Asnières," is shown above. It, and the other work, is an oil on canvas, 21 1/2 by 26 1/4 inches. It has a conservative estimate of $1,200,000 to $1,600,000. It sold for $1,766,000 while Lot 35 sold for $1,436,000. The auction has some nice paintings by Pierre-Auguste Renoir. The most charming is Lot 31, "La Conversation," a 12 3/4-by-16 1/8-inch oil on canvas, 1895, shown above, that has a modest estimate of $1,000,000 to $1,500,000. It sold for only $831,000. From the Frank Hadley Ginn and Cornelia Root Ginn Charitable Trust comes a sweet portrait of a girl adjusting her hair, "Tete de jeune fille," Lot 5, a 14 by 10 inch oil on canvas, 1890, which has an estimate of $1,200,000 to $1,600,000. It sold for $1,656,000. Lot 27, "Berthe Morisot et sa fille, Julie Manet," is an historical important work that has been in the collection of Morisot's daughter's family. Morisot was a very fine and important Impressionist painter who married the brother of Edouard Manet after being his model for a while. The 32-by-25 1/4-inch oil on canvas was painted in 1894 and has an ambitious estimate of $9,000,000 to $12,000,000. It sold for $8,806,000. Another Renoir, Lot 43, depicts another famous woman artist, Suzanne Valadon. It is 21 1/2 inches by 16 1/4 inches and was painted circa 1885. It is quite affecting and has a modest estimate of $800,000 to $1,200,000. It sold for $996,000. The auction has several important Rodin sculptures including Lot 26, "Le baiser," a 34-inch-high bronze statue of "The Kiss," that was cost in 1887-8 and has an estimate of $2,000,000 to $3,000,000. It sold for $2,756,000 and several other Rodins also did very well, a reflection that they were early casts with fine patinas. Of 47 lots offered, 42, or 89 percent sold and the sale totalled $104,542,000, which fell within the pre-sale estimate of about $101- to $137-million. Christopher Burge, the auctioneer, said that he was "extremely pleased" with the auction's results, noting that there was "a lot of activity" in the room. While there were 40 or so phone "agents," one man wearing no jacket, no tie, and a black-colored gray sport shirt bought three paintings. By dollar amounts, only about 35 percent of the buyers were American and more than 47 percent European, which was not surprisingly given the many conversations held by elegant auction goers in French and Italian. Asian was well represented in the room although they were not too active as bidders. The sale had 24 lots that sold for more than $1 million, 13 sold over their high estimates, 17 fell within the estimates and 12 sold for below the estimates, according to Mr. Burge. That is a quite a reasonable percentage and Burge described the market as "sensible." In response to a question at the post-sale press conference, Mr. Burge said that to his knowledge Christie's had not competed directly with Phillips for any of the sale's consignments, but he added that there were "a few with Sotheby's." The market continues to be a bit unpredictable. The Lautrec was a very fine work and not overvalued and the Gauguin was a truly interesting and a very good, important work by Gauguin that also was not overvalued. Their failure to achieve better results probably reflects the lack of expertise and experience of many current collectors, although, on the other hand, the good price achieved by the Caillebotte was impressive for he is not a household name and his works are not the typical pastoral postcard scenes but in fact a very sophisticated and strong work. Considering the fact that the economic markets were weak in the immediate period leading up to the auction, the somewhat lackluster results may not have been stellar, but certainly did not denote a collapse in the art market, a subject that was on quite a few lips in the gatherings outside the auction horse prior to the auction, more so than the current anti-trust investigation.